Our Black Friday visit to Jim Thorpe included shopping along Broadway. One marvelous shop at 61 Broadway, The Vintagerie, offered a small bin of antique post cards. Vaguely curious, I picked up a pile. Many were unused. A few, like the two below, travelled the US Mail, included post marks, postage and communications. Please click any of the following images to visit a work from my online gallery. Hover your mouse over each image for more information. Verna’s slanted and precise cursive, the message carefully planned to fit available space, demonstrate her to be stylish. The bathing suit was purchased for the trip. Before leaving, Verna shared the purchase with her acquaintance, Mrs. Nace (misspelled Nase). Fourteen months after their vacation, the Stock Market Crashed, October 1929, leading to The Great Depression. How were Fred and Verna affected? Were there Atlantic City vacations? The next card was purchased and sent from Allentown. It is unlikely Sara was on vacation, was it purchased during a rare trip to the city? 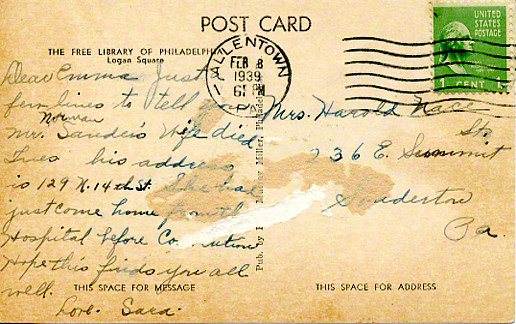 I know Verna misspelled Nace because, ten years into the great depression, Mrs. Nace, Emma, received this postcard from Sara. The postage is still 1 cent. Emma has moved to a new address. The message is more significant, written in a hurried hand by Sara, who concludes with love. Emma Nace kept these cards as treasured possessions and memories until, with her passing, they were acquired, maybe in an estate sale, bundled together, transported 54 miles to 61 Broadway to be found by me, scanned (digitalized), and sent along in this blog.